While doing item restoration I noticed I can restore keystones I destroyed from previous weeks. If this was already posted feel free to lock it. This seems like interesting way to exploit game mechanics and have multiple keystones for sell boosts if you are doing 'em each couple weeks. Don't try to loot keystone from mail because it will vanish if you have 1 in bags already. Also key in mail has affixes from week it was destroyed. 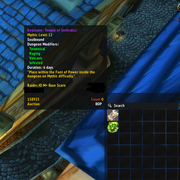 Haven't picked it from mail since I want to push my 12, mate from guild advised to not even try to pick it up since his vanished with error that item already exists (assuming it was caused by his key in bags). So i need someone to test further. Definitely needs some more testing. So if anyone wants to play with this please report back your findings.